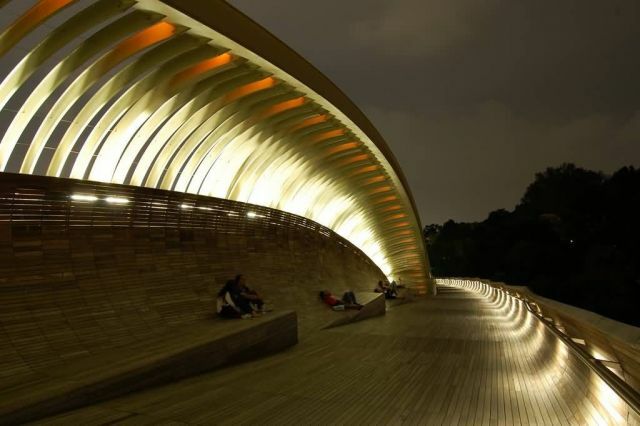 Henderson Waves is a 274-metre long pedestrian bridge. At 36 metres above Henderson Road, it is the highest pedestrian bridge in Singapore. It connects Mount Faber Park and Telok Blangah Hill Park. It was designed by IJP Corporation, London. The bridge has a wave-form made up of seven undulating curved steel ribs that alternately rise over and under its deck. The wave-forms are lit with LED lamps at night from 7 pm to 2 am daily.